One of the neatest custom options available on the Gause Built 23 is lockable rod storage. 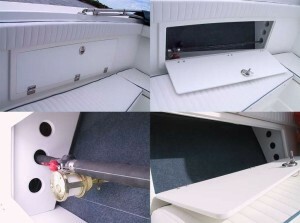 On each side of the boat an enclosed locker is created with purpose built storage for three rods. The door to this locker is secured with a locking latch assembly. When closed and locked 6 rods can be stored out of sight and secure, inside these beautifully finished cabinets. When fishing a tournament there is no longer a need to carry all your expensive rods up to the hotel room each night, just leave them where you’ll need them next, right on the boat. The deck of the Gause Built 23 was designed with a dodger in mind. 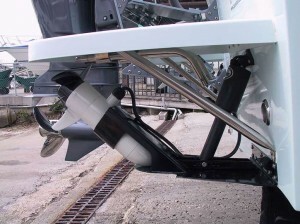 There is a raised lip which serves as the area where the bottom of the dodger attaches to the boat. This allows the water to be channeled away creating a very well protected area beneath the canvas. The dodger can be lowered, and fold down securely just outside of that slightly raised lip in such a way that it is very unobtrusive. 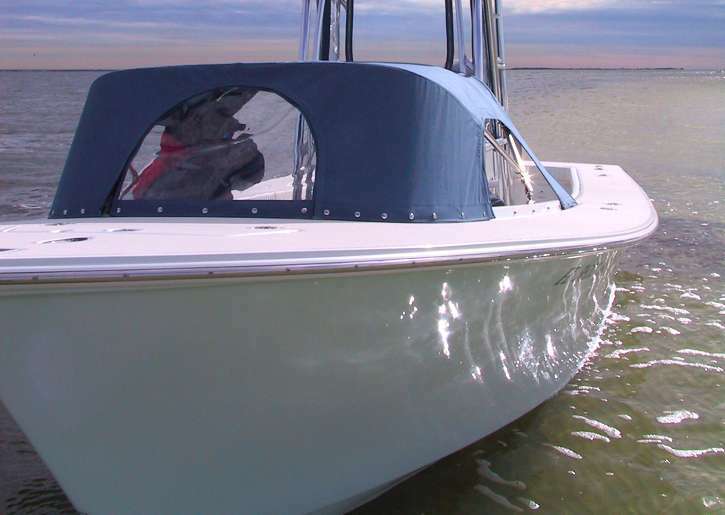 The dodger can be ordered with removable windows at the front and sides, and Gause Built Custom Boats has even created one with doors at the back creating a completely enclosed area which could be used for sleeping overnight out on the water. Troll n Tab kit with swim ladder. Many of the boats are equipped with Lenco Troll’n Tab kits which can be mounted under the optional Swim Platforms. Even with the Troll’n Tabs installed there is still room for a stowing swim ladder to be mounted below the swim platform. This ladder remains securely stowed out of site and out of the way when not being used, but quickly releases and drops down for use when you’re ready. All these features and many, many more are available for your next Custom Built Gause Boat. Give us a call or come out for a ride and let us demonstrate just how well this 23 foot design works, and how we can build the “perfect” boat for you. Flats Skiff? Center Console Fishing Boat? Get both and more in a Gause Built 23!